I recently got a pair of the newest tennis shoe from Wilson, the Wilson KAOS. As you know, having comfortable, durable, and stable tennis shoes is essential for every tennis player every time they step onto the tennis court. My first impression of the Wilson KAOS was “WOW! That’s a loud tennis shoe!” I happened to get the red & lime colored shoe, so it was a bit brighter than the darker colored tennis shoes I normally wear. Nonetheless, they looked very inviting and comfortable. I wear a size 10.5 US, some tennis shoes I have to get a half size bigger and some a half size smaller. I found that the Wilson KAOS fit just perfectly and didn’t feel that I needed to go up or down in size. I had plenty of room in the toe-box and my foot felt snug from the heel to the arch. 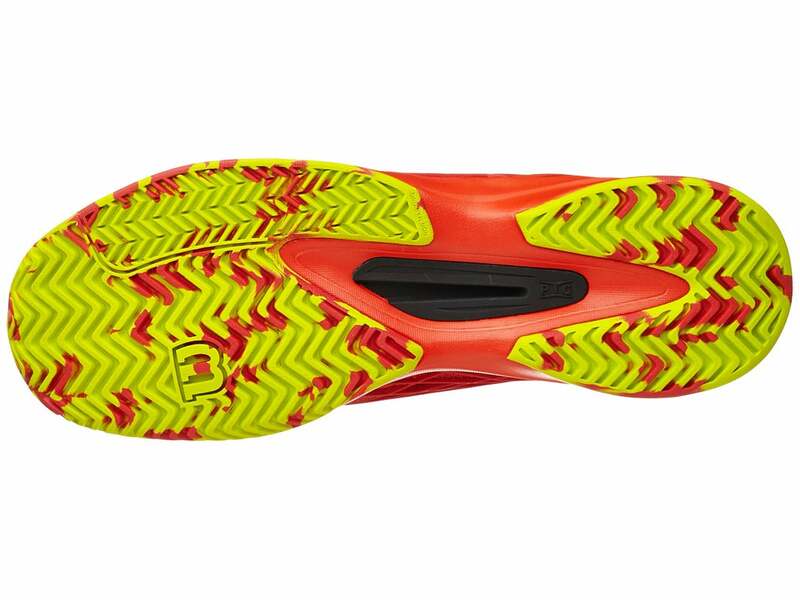 The Wilson KAOS tennis shoe has the tongue sewn in to create a glove-like fit. I certainly felt that this added good stability as I felt more connected with the tennis shoe. As I wore the shoe more and more, I sometimes felt that my foot felt too snug and almost like my foot was swelling. I would have preferred a more traditional tongue. First thing is first, the Wilson KAOS is not exactly feathery and it’s not a cinder block. The shoe weighs in at 13.5 ounces (compared to the Adidas Barricade 2016 at 15.1 ounces and the Babolat JET AC at 12.9 ounces) which is pretty much right in the middle of heavy and lightweight. As I played tennis with these shoes on, I was fairly impressed with the weight of the tennis shoe. The KAOS seemed to have been designed to be weight distributed. What I mean by that is that it feels like the shoes’ weight is not centered on a singular place (heel, herringbone, toe), the weight is throughout the shoe making it feel more snug. Of course, the longer I played, the heavier the shoes felt heavier! That has nothing to do with the Wilson KAOS tennis shoe, it has everything to do with my stamina. There’s nothing better than a tennis shoe where you feel confident in chasing a ball down or moving laterally with explosive movement. The Wilson KAOS definitely gave me the confidence to make all my movements without worry of the shoe sliding out or rolling an ankle. The Wilson KAOS tennis shoe was made with Duralast soles, a very durable and traction-favoring bottom. I was easily able to start and stop, move side to side, and have confident movements in these tennis shoes. A couple of the performance of the Wilson KAOS are limited to two things; firstly, the shoe isn’t as breathable as I would like it to be. I definitely felt my feet getting hot (especially in the Southern California heat) as I played. It made my feet feel sweaty and uncomfortable. A bit of better ventilation would be great, especially around the toe-box. 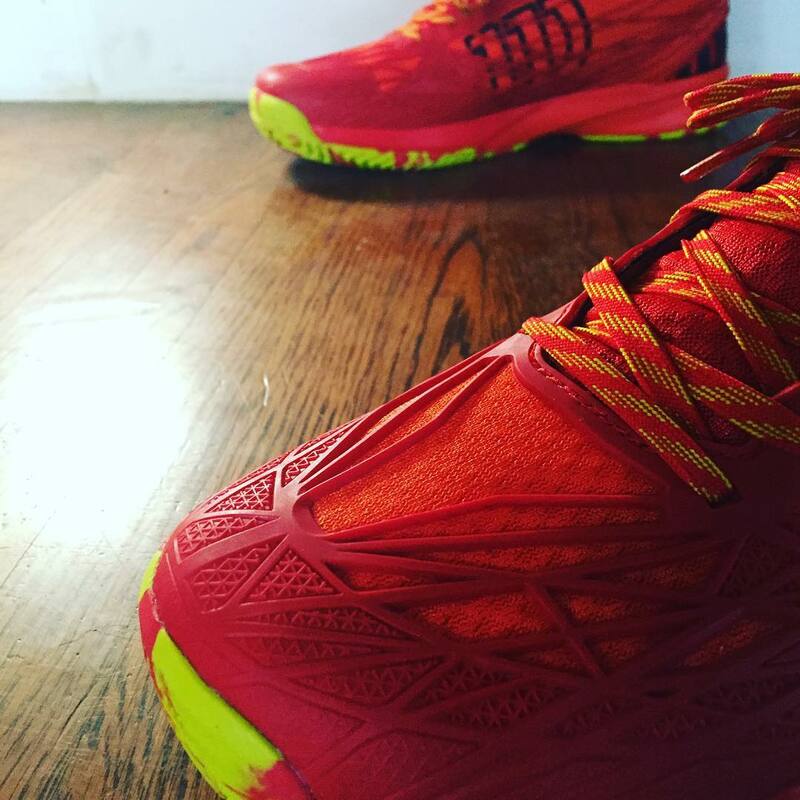 The second thing I dislike about this tennis shoe is while the fit is great; I noticed as I have worn the shoe in a bit and it has loosened up a little, my toes jam pretty hard when I would be moving forward and have to stop quickly; my foot would just keep moving as the shoe stopped. It’s a bit surprising since the Wilson KAOS tennis shoe is built to keep the foot in place. Perhaps I should tie them a little tighter? I liked this tennis shoe, a lot. I have tried other tennis shoes that I would rank a little higher than the Wilson KAOS, but not by a lot. The traction is very much above average. The fit is pretty good, maybe a little loose after the break-in period. 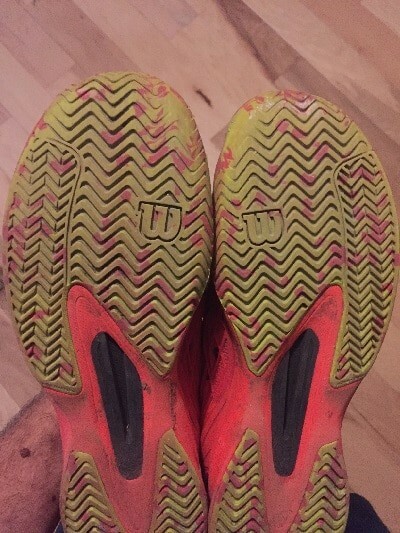 I’m still playing with them so I’m still testing the durability of the shoe, though I can tell you after about 12 hours of play the Wilson KAOS sole, around the toe, has started to wear down. Unfortunately the Wilson KAOS does not come with a 6 or 12 month durability warranty. I was really impressed with the traction and stability the shoe provided. It was comforting to be able to move around quickly, change direction, and take off all without worrying about loosing my footing or falling. Pick up a pair of Wilson KAOS tennis shoes from Tennis-Warehouse!